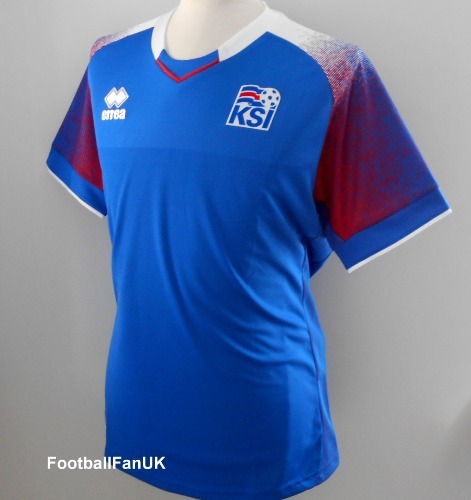 This is the 2018-2019 season home shirt of the Iceland national soccer team to be used by the team in their historic World Cup 2018 finals matches. This is an official Errea shirt and is new in Errea packaging. We are an official Errea stockist and only sell official/authentic shirts, so you can buy with complete confidence. The new Iceland 2018 World Cup jersey combines the traditional home colours - blue, red and white. The red represents the fire that burns and warms the heart of Iceland, whilst the blue signifies the ice that slowly melts turning into water. - Features KSI Federation badge. - Errea logo on chest. - Iceland flag printed at back of neck. - 'Fyrir Island' (For Iceland) printing inside neck. - Blue with red and white graphics and trim. - New in Errea packaging. - Made in the EU from 100% polyester. - Adult Medium. Chest 43", length 29" - Loose fit. - Adult Large. Chest 45", length 30". - Adult XL. Chest 47", length 31". - Adult XXL. Chest 49", length 32".